AORI publishes their own newsletter bi-yearly. 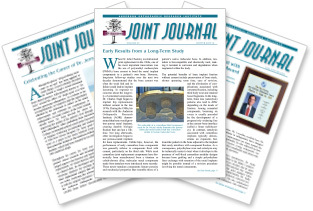 To read more about our research and the wonderful effect it has on the lives of patients, click on the link to download any of our Joint Journals below. We would love to add you to our mailing list! Please go to our Contact Us page and send us your name address and email. Specify whether you would prefer an electronic copy or a printed copy of our newsletter. You’ll need a copy of Adobe ® Reader to open the newsletters. Click here to download it for free.